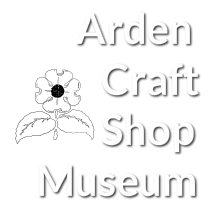 Q: What items does the Arden Craft Shop Museum collect? A: The Arden Craft Shop Museum will collect objects, photographs and archival material directly relating to the history, art, and residents of the Ardens which include the communities of Arden, Ardentown, and Ardencroft. ACSM pays particular attention to collecting objects, photographs and archival material related to the artists and artisans that have lived and/or worked in the Ardens. The Arden Craft Shop Museum (ACSM) collects and maintains the official records and printed materials of the Arden Archives and ACSM. ACSM also collects primary source materials directly pertaining to or produced by residents of the three Ardens. Q: If I want to donate items to the collection, what do I do? Please do not bring materials to ACSM without an appointment. Q: Are all donations accepted? A: Unfortunately, we cannot accept everything we are offered. Organizing, cataloging, and caring for historic collections takes a significant amount of space, time, and money, and as such, donations must be very carefully selected. ACSM staff reviews all potential donations. All items must be seen before a decision can be made, though printed materials may be easily checked against a list of items already in our collection and therefore may not have to be seen ahead of time. Q: Will my donation be part of an exhibit or put on display? A: In general, your items will not be put on display right away (an exception is if materials are designated for a specific exhibit). Most museums only show about 5% of their collections at any given time, and the rest of their holdings are carefully stored for future exhibits and researchers. Q: How to I prepare my donation? A: Beyond sending us the information requested above, you don’t have to do anything! In fact, please do not clean, repaint, refinish, or otherwise alter your items, as we prefer to see historic materials in their original condition. A: Yes! However, we cannot appraise items or advise on the tax code. Donors are responsible for determining and documenting the value of their donations. Q: Can I lend items to the museum rather than donate them? Can my heirs get things back? A: We do not accept items on long-term loan, and heirs will not have donated materials returned to them unless ACSM has determined that it can no longer care for an item and it must be deaccessioned and given to a more appropriate caregiver. On some occasions, ACSM will accept short-term loans for specific exhibits. Q: Can I bequeath items to ACSM in my will? A: Yes. If you would like to do so, please contact us at ardencraftshopmuseum@gmail.com and let us know that you are planning to do so. We value the stories behind materials, and speaking with you about them gives us the opportunity to collect as much information as possible about items before they are entered into our collection. Bequests must meet the same requirements as other donations and are subject to approval by the Archives Committee. To learn about gifts to the annual fund, please email ardencraftshopmuseum@gmail.com. Q&A adapted from Delaware Historical Society’s policy on donating to the DHS.